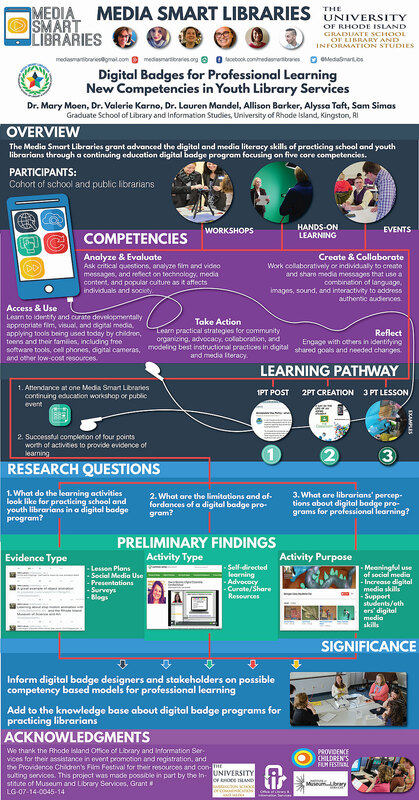 MOEN, Mary (2017) Media Smart Libraries: Advancing the Digital and Media Literacy Skills of Practicing Librarians through a Digital Badge Project. Paper presented at: IFLA WLIC 2017 – Wrocław, Poland – Libraries. Solidarity. Society. in Session 112 - Poster Sessions. Digital media and technologies have transformed the library user needs and services of children and teens. School and public librarians must rise to the challenge and lead digital and media literacy efforts to better serve youth. The Media Smart Libraries grant program, awarded to the University of Rhode Island and funded by a grant from the Institute of Museum and Library Services, is advancing the digital and media literacy skills of practicing school and youth librarians through a continuing education digital badge program focused on five core digital and media literacy competencies. A content analysis of badge evidence submitted by a cohort of librarians who completed MSL’s digital badge program was conducted. 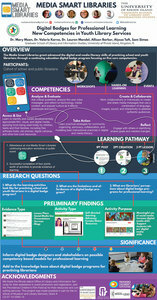 Preliminary findings show that the learning activities clustered around themes of wanting to use social media more meaningfully; supporting youth, educators, and parents in digital and media literacy; supporting the broader mission and goals of their school or library; and increasing their own expertise in digital and media literacy competencies. The results from this study will add to the knowledge base on the effectiveness of digital badges to increase competencies in new knowledge and skills for practicing librarians. The significance of study is that it can inform digital badge designers and stakeholders on possible competency based models for professional learning and add to the knowledge base about digital badge programs for practicing librarians.